Shipping methods are applied to both sales orders and goods-out notes in Brightpearl.The shipping method used for a goods-out note is inherited from the original sales order, unless changed at point of fulfillment. However, it can also be changed when marking the goods-out note as packed. This is allows late changes in the shipping method to be recorded, and it won't change the original shipping method assigned to the sales order so there will always be a record of what the customer originally requested. Shipping methods must first be created in Brightpearl settings before they can be assigned to orders. Once a shipping method has been used it cannot be deleted unless removed from all records using it. Brightpearl has several stages to setting up full shipping quotes and charges (using shipping zones and prices) but to simply filter and manage orders and goods-out notes, only the shipping method needs to be created. Go to Settings > Shipping > Shipping methods. Click to add a new shipping method. Enter a name for the method. This is how you will see it displayed throughout Brightpearl. Enter a code for the method. This is used for displaying the method on templates as well as matching the shipping method to downloaded orders. (Optional) List of countries - Enter the country codes for which this method is applicable. You will also need to set this on the shipping zone. Break type - Select whether charges should be calculated based on order weight, price or number of items. Breaks - Specify the different pricing scales. e.g. if you select to break by number of items enter 10,15,20,9999 to specify different prices for up to 10 items, 11 to 15 items, and 16 to 20 items, and a price for over 20 items. Require weight/boxes in warehouse manager - If this is set to yes, then the total weight and number of boxes can be entered when packing the shipment in Brightpearl. Save the shipping method to finish. If you wish to use shipping quotes and prices, now continue to set up shipping zones and then shipping prices. When entering an order directly into Brightpearl the shipping method can be manually assigned or automatically assigned along with a charge using shipping quotes (learn more below). For orders downloaded from sales channels the order will be automatically assigned the shipping method by matching the channel shipping method name with the Brightpearl shipping method name/code. Shipping charges are always shown on an order as a separate line item. For downloaded orders the charge applied is always the amount dictated by the sales channel. To use shipping quotes and charges you will need to configure shipping zones, methods and prices. Begin a new sales order and add all the items and products. Scroll to the bottom of the screen to view the Shipping Prices section. This section will only display if activated in the Sales Settings. If this section is visible but no options are shown then the order does not meet the requirements defined by the shipping method and shipping zones. Click on the shipping method/charge to apply to the order. The charge is added as a line item and the method is shown in the shipping method field. Shipping charges can also be manually added as a miscellaneous line item without using the shipping quotes and prices. A shipping zone allows you to define separate groups of countries where shipping methods are applicable. Different pricing can be defined per method per zone - that is pricing can be different depending on the country. Go to Settings > Shipping > Shipping zones. Click to add a new zone. Enter a name for the zone, such as "Europe". If this zone includes particular countries, enter the country codes. Ensure the country codes match the codes in Brightpearl at Settings > Company > Countries. Note that you should use GB and not UK. 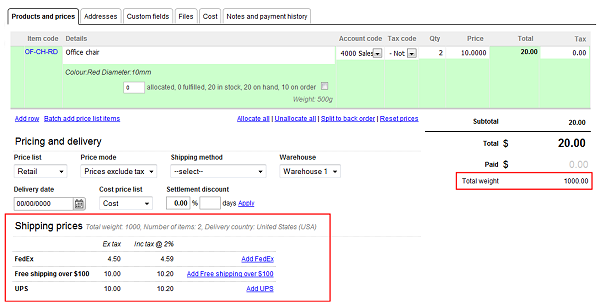 Shipping prices are defined per method and per zone. Templates can be assigned directly to shipping methods so that the correct design goods-out note is printed based on how the items are being dispatched. If a shipping charge is manually added as a row on a sales order, the account (nominal) code will need to be manually set on the row.